Baseball and Brooklyn have always shared a unique connection - one that is as historical as it is mythical. For nearly half a century that bond was made even more legendary by its absence, and the collective longing of millions to fill a void that had been left in their hearts. Since 2001 the Cyclones have been one of New York’s hottest attractions - winning championships, setting attendance records, and creating countless memories. Its roster - both coaches and players - has been made up of former and future stars. Through it all, there has been one constant...the loyalty and passion of the Brooklyn fans. 44 years after the Dodgers moved to Los Angeles, a new professional team was born in baseball’s favorite borough. Discussions between former Mayor Rudolph Giuliani and an ownership group led by Fred and Jeff Wilpon, and Saul Katz led to a chain of events that brought the national pastime back to the hometown of all the men involved - Brooklyn. Ground was broken at the site of the former Steeplechase Park in August of 2000, and construction began immediately, in preparation for Opening Day less than a year away. The Cyclones played their first home game on June 25th of 2001. The thousands of fans and hundreds of media members on hand for the event did not leave disappointed. With the team down by two runs, and down to their last out, third baseman Edgar Rodriguez drilled a two-run home run over the left field wall, and sent the sellout crowd into a frenzy. In the tenth inning, a sacrifice fly by Mike Jacobs won the game, and the legend of Brooklyn baseball had been reborn for a new generation. The Cyclones went on to dominate the regular season, going 52-24. The team was 30-8 at home, with Brooklyn fans rarely ever seeing a loss. They also set a new league attendance record, with 289,381 fans entering the gates at KeySpan Park. The team had a potent mix of offense, defense, and pitching that simply could not be matched that year. Brooklyn led the league in team batting average (.279), home runs (58), and ERA (2.37) and had individual players sprinkled throughout the league’s leaderboard. The postseason became a foregone conclusion, and in the first round of the playoffs, the fans got the match-up they wanted most, as Brooklyn faced the rival Staten Island Yankees. The Cyclones lost the first game of the best-of-three-series, but the series shifted back to KeySpan Park for the final two games. The Cyclones fell behind again early, and looked as if they might be swept out of the first round. The team roared back, though, thanks to pitching performances by Mike Cox and Harold Eckert, and the bats of John Toner, Brett Kay, Angel Pagan, and Frank Corr. In an electric Game Three atmosphere, Brooklyn kept its momentum, thanks to an exceptional performance by lefty Ross Peeples, defensive gems by Kay and Toner, and more clutch hitting by Kay and Pagan. Blake McGinley sent the Yankees home 1-2-3 in the ninth to set off a raucous celebration in Brooklyn. The Cyclones faced the Williamsport Crosscutters in the League Championship Series, one which was cut short by tragedy. Brooklyn won the first game of the best-of-three series 7-4, but the next day, the terrorist attacks of September 11th ended the series and the magical summer. Brooklyn and Williamsport were declared co-champions. Brooklyn's sophomore season was marred by injuries, and losses in 12 of the final 15 games knocked them from the playoff hunt. The excitement of Brooklyn baseball was growing, though, and the team became the first Short-Season club ever to draw more than 300,000 fans with a record-setting 317,124 fans in 38 openings. Those fans were treated to some special performances throughout the summer, as righthander Kevin Deaton went 7-1 with a 3.07 ERA and 93 strikeouts, one shy of the league lead. Blake Whealy was a super-utility-man, pacing the team in nearly every offensive category, and ranking third in the league in home runs, with 10. RHP Miguel Pinango gave the fans a thrill on August 23rd, when he hurled a one-hit 5-0 shutout. Pinango took a no-hitter into the last inning, and had two strikes and two outs, before surrendering a flare into right field. He got the next batter to pop out on the next pitch. Much of the buzz of 2002 focused on the first first-round pick to play for the Cyclones, Scott Kazmir. The lefty had been touted as one of the top prospects in the country, and named the nation's best high-schooler by Baseball America. The 18-year-old from Texas soon showed Brooklyn why. Armed with a 96-MPH fastball, and electric movement, Kazmir dominated the league. Having signed late, and after a long layoff, he was used sparingly and cautiously, throwing just 18.0 innings over five games. In that time, though, he struck out an amazing 34 batters, and held opponents to an .089 average against him. He had passed his first test in the professional ranks with flying colors. Brooklyn returned to the playoffs in 2003, but fell short of the ring, losing in two games to Williamsport. The team again hit the elite 300,000 mark in attendance (307,383), and came close to one million fans in the three-year history. In 2003, the Cyclones' pitching was their strength throughout much of the season. Starters Matthew Lindstrom and Brian Bannister occupied spots on the league leaderboards all summer, and propelled the Cyclones to the top of the division. If the Cyclones held a lead late in the game, they handed the ball to co-closers Carlos Muniz and Robert Paulk, who finished third and first, respectively in saves in the NYPL. Brooklyn finished with a 2.97 team ERA, third-best in the league. 1B Ian Bladergroen and OF Rashad Parker led the offense. Bladergroen led the team in nearly every category, and set a team record with 74 consecutive games played. Parker showed a blend of power and speed, mixed with aggressive defense. After besting the Oneonta Tigers two games to one, Brooklyn moved to the Championship Series, where they again faced Williamsport. The Cyclones could not pull off another comeback, though, and lost in two games, including the decisive one-run, 4-3, 11-inning Game Two thriller at KeySpan Park. 2003 also saw the Cyclones filter into the big leagues. Danny Garcia, who played second base for the team in 2001, was called up to Shea in September, after blazing his way through the farm system. Garcia cemented his place in team history, as the first former Cyclone to make it to the major leagues. He got a hit in his first major league at-bat, off former Met Mike Hampton. Later in the year, he hit his first major league home run during a day game - and then drove across town to KeySpan Park, where he was scheduled to throw out the ceremonial first pitch of the night game. The 2004 Cyclones were an exciting, hard-nosed group that blended speed, power, and pitching to win the division. The team fell to Tri-City in the playoffs, thanks in part to a series of rain delays and cancellations that led to them facing the league's best starting pitcher twice in a three-game series. The Cyclones once again led the league in attendance, with 294,229 fans. In addition, the 1,000,000th fan in Cyclones history walked through the gates at KeySpan Park - reaching the mark faster than any team in Short-Season history. Outfielders Corey Coles, Dante Brinkley, and Ambiorix Concepcion, along with first baseman Tyler Davidson, were the offensive stars. Brinkley, Concepcion, and Davidson ranked in the league's top ten in average, while Coles was a spark at the top of the lineup, and led the league in triples. Concepcion proved to be one of, if not the most exciting players in the league, and he led the Cyclones in both home runs and stolen bases, along with outfield assists. The pitching staff was anchored by lefties Evan MacLane, and Joe Williams, and righthanders Michael Devaney and Mike Swindell. Carlos Muniz was the stopper early in the season, and then Celso Rondon took over the duties and closed the door just as effectively. A number of young arms also made their debuts, including Scott Hyde, Gabriel Hernandez, and Blake Eager. And Eddie Camacho - "Everyday Eddie" - who became a stalwart in the middle-to-late innings. 2005 marked the fifth year of Brooklyn baseball's renaissance on Coney Island. Mookie Wilson -- a fan favorite and franchise icon for the New York Mets -- was at the helm for the Cyclones, and the borough once again buzzed for the new boys of summer. The '05 Cyclones were a streaky team -- they won three or more games in a row five times, and lost three games in a row six times -- who stayed in the playoff hunt through the last days of the season, eventually falling short of a Wild Card berth. 2005 also marked another special anniversary for Brooklyn baseball, as the borough - and the world - celebrated the Brooklyn Dodgers’ magical 1955 World Championship. The Cyclones added to the celebration by honoring some of the Dodgers in a special pre-game ceremony. Pitchers Carl Erskine, Clem Labine, and Ed Roebuck reunited with outfielder George “Shotgun” Shuba and Joan Hodges - widow of the legendary Gil - to bring the memories of the past back to life at KeySpan Park and in the Brooklyn Baseball Gallery. The honorees circled the field in ‘55 convertibles before throwing the ceremonial first pitches, and Erskine even kicked off the game with a rendition of the National Anthem on his harmonica. Throughout the season, a number of players took center stage for the Cyclones, particularly Joe Holden, Bobby Parnell, and Josh Petersen, who were named to the NYPL's All-Star Team. Parnell finished the year with a league-leading 1.73 ERA in 73 innings, and was named the NL All-Star Team's starting pitcher. Holden was a catalyst atop the Brooklyn lineup, leading the team in average (.291) and placing third in the league in stolen bases (22). Petersen was a force early on, but a back injury slowed him, and stopped him from participating in the All Star Game. The All-Star Game itself -- the first in the league's history -- was hosted by Brooklyn on August 23rd, and was the first pro baseball All-Star game in the borough since 1949. The pre-game festivities included a home run derby, a gala event at the NY Aquarium, firebreathers, sword swallowers, and a celebration that made the ASG a once-in-a-lifetime experience. With Brooklyn playing host, the National League fittingly won the game, by a score of 5-4. Not all of Brooklyn's stars were All-Stars, though. Caleb Stewart - "Big Stew" - was the team's most productive hitter in 2005, leading the Cyclones in virtually every offensive statistic, including games (74), at-bats (265), runs (39), hits (72), doubles (23), home runs (10), RBI (45), extra-base hits (35),walks (47), and intentional walks (5). The 2006 season was filled with ups and downs befitting the team’s namesake roller coaster. The Cyclones had two seven-game losing streaks, but reeled off winning streaks of four, seven, and 13 games in between! In one amazing stretch of the season, Brooklyn won 30 out of 41 games. Buoyed by that July performance, and thanks to wins in six of the team’s final eight games, the Cyclones fought their way into the playoffs, edging out the Aberdeen IronBirds by half a game. In the first round of the playoffs, though, Brooklyn was derailed by eventual champion Staten Island, two games to none. Throughout the season, the Cyclones staged stunning comebacks, and showcased some of the league’s brightest prospects. In a season of memorable moments, however, perhaps the longest-lasting one was created by the longest-lasting game. On July 20th, the Cyclones and the Oneonta Tigers made history when they played the longest game in the NYPL’s nearly-seventy-year history. The teams waged battle for 26 innings, over nearly seven hours, before Oneonta broke through against an outfielder called in to pitch for the first time since high school, Mark Wright. The Tigers scored five runs in the top of the 26th (after Wright pitched a scoreless frame in the 25th) to win the game 6-1. The marathon garnered national attention, and, according to manager George Greer, was a rallying point for a team that went on to win 16 of its next 18 games. In 2006, the Cyclones’ pitching staff was the team’s most consistent asset, with Brooklyn pitchers placing third in the NYPL, with a 3.41 team ERA. Two starters in particular racked up the lion’s share of wins and strikeouts for the staff -- Eric Brown and Tobi Stoner. Brown went 7-1 to lead the team in victories, and ranked second in the league with a 1.16 ERA. The 6’6” righthander also showcased pinpoint control, as he fanned 55 batters, and walked just four. Stoner nearly matched Brown step for step, going 6-2 with a 2.15 ERA that ranked fourth in the NYPL. In his first professional season, Stoner also led the team in K’s, striking out 62 batters, while walking just 17. Jake Ruckle -- using his unorthodox, high leg kick windup, dubbed the “Ruckle Shuffle” -- battled a back injury to round out the pitching staff’s Big Three, going 5-3 with a 3.38 ERA and 51 strikeouts. In the bullpen, the Cyclones were just as tough on opposing hitters, thanks to relievers like Jeremy Mizell, Rip Warren, and Jose De La Torre. The star of the ‘pen, however, was a 22-year old whose dominance in the NYPL was a sign of even bigger things to come -- closer Joe Smith. Smith, a third-round selection by the Mets in June of ‘06 out of Wright State University, had the team’s most eye-popping numbers. He allowed a run in his first appearance, and then went unscored upon for more than a month. In 17 appearances for the Cyclones, Smith racked up nine saves, and sported a miniscule 0.45 ERA, with 28 strikeouts in 20 innings. He was as automatic a closer as the team - and the league - had ever seen, as opponents rarely even reached base against the flamethrowing sidearmer with the nasty slider. NYPL teams hit just .141 against Smith, and he issued only three walks (one intentional). In late July, he was promoted to Binghamton, becoming the first Cyclone to jump straight to Double-A. His meteoric rise continued the following spring, as Smith was named to the Mets’ 2007 Opening Day roster -- making the jump to the big leagues faster than any Cyclone in history. Among the hitters, outfielder Dustin Martin was the star of the lineup, leading the team in virtually every offensive category. Known to his teammates as “Sunshine,” Martin shined brightly throughout the entire year. He hit .315 (79-for-251) -- fourth-best in the NYPL -- with 22 runs, 15 doubles, seven triples, two home runs, and 35 RBI. He also led the team with seven stolen bases, and made spectaculer defensive plays with regularity, manning the high left-field wall at KeySpan Park. At the 2006 NYPL All-Star game, the Brooklyn contingent was the largest in the league, with six Cyclones playing in the mid-summer classic. Martin, Brown, Ruckle, and Mizell were joined by shortstop Luis Rivera and catcher Jason Jacobs. Mizell was a bullpen stalwart, tossing 33.2 innings, and going 2-0, with a 1.34 ERA. Rivera was a consisent contributor on offense with a smooth set of hands in the field. Jacobs was a gritty leader behind the plate, who handled the Cyclones pitching staff with aplomb. Together, the six represented Brooklyn for the NL stars in the league’s second-annual All-Star Game, in Aberdeen, MD. 2007 was one of the most successful years ever for the Cyclones. On the field, Brooklyn stormed to the best record in the New York-Penn League (49-25), the team's fourth McNamara Division title in seven seasons, and its third appearance in the NYPL Championship Series. The Brooklyn squad featured superb pitching (the team's 2.93 ERA was far and away the best in the NYPL), clutch hitting, and the league's best defense (.977 fielding percentage). The Cyclones led the McNamara Division from wire to wire -- from Opening Day through the end of the season. Several individual performances stood out, as well. Six Cyclones were named to the NYPL All-Star Team: SS Matt Bouchard, 3B Jake Eigsti, C Jason Jacobs, OF Brandon Kawal, RHP Will Morgan, and RHP Dylan Owen. Bouchard captained the infield with spectacular defense; Eigsti carried the club for a month driving in runs and reaching base at a record pace; Jacobs led the team in home runs and tied the club record for RBI; Kawal hit .302 and was a solid contributor in the field as well; Morgan was nearly untouchable out of the bullpen; and Owen was simply the league's most dominant pitcher, leading the NYPL in wins (9) and ERA (1.49). Lucas Duda also had a standout year, showcasing power and contact ability, and setting a new club record with a 17-game hitting streak. Dillon Gee was another outstanding pitcher, ranking sixth in the league with a 2.49 ERA, striking out 56 and walking just nine. Raul Reyes made eye-popping catches in centerfield, and clubbed nine home runs. J.R. Voyles became a cult hero for his clutch-hitting ability, and his comebacks from two separate injuries. Micah Schilling was almost always on base and scoring, setting franchise records for walks and runs. Every single member of the team made an impact on the 2007 season, from the offense to the defense, to the starters, to the bullpen, and everything in between. Manager Edgar Alfonzo notched his 100th win in a Brooklyn uniform, and finished two wins away from his second league championship. The 2007 season, though, was about more than just great baseball. Fans were treated to a giveaway, special appearance, or fireworks show at every single game. Brooklyn legends like Don Newcombe, Lee Mazzilli, Larry King, Rachel Robinson, Dan McDevitt & Joe Pignatano, and others joined the festivities at KeySpan Park. Collectible giveaways like bobbleheads, bobblebridges, ballpark models, jerseys, caps, and bats were among the hottest items of the summer. Superheroes, knights on horseback, performing dogs, roaring Harleys, Rock Paper Scissors combatants, a Stallone tribute, heritage nights, and much more, created once-in-a-lifetime memories all summer long. And the fans responded, in record numbers. Brooklyn drew the franchise's two millionth fan in 2007, faster than any Short-Season team ever. The team set a new single-game attendance record, with 10,073 fans on September 7th, and led the NYPL in attendance for the seventh consecutive season. 2007 was indeed a magical season. 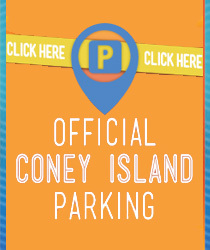 Packed with thrilling baseball, exciting entertainment, and the unmatchable atmosphere provided by the Coney Island seashore, KeySpan Park was the place to be. In 2008, Brooklyn was a home to some of the organization’s top prospects, with 11 of the Mets’ first 15 draft picks playing for the Cyclones – including, for the first time, New York's top three picks. Ike Davis (18th overall), Reese Havens (22nd overall), and Brad Holt (33rd overall) formed a talented trio, but Davis and Havens struggled with injuries throughout the season. Holt, on the other hand, made his mark as the best pitcher in the league, and won Brooklyn's Sterling Award, as the team’s Most Valuable Player. The 22-year-old from Albemarle, NC took a bite out of the Big Apple during his time in Brooklyn, leading the team -- and the league -- in ERA and strikeouts during a dominant first season in professional baseball. Holt went 5-3 with a league-best 1.87 ERA and 96 strikeouts in 14 games. In 72.1 innings, he allowed just 43 hits, 18 runs, 15 earned, and 33 walks. In addition to leading the league in Ks, his strikeout total set a new franchise record for the Cyclones, eclipsing the previous mark of 93, set by Kevin Deaton in 2002. Holt finished the season with an eye-popping 10.7 Ks per nine innings pitched, and was named to the New York-Penn League All-Star Team in mid August. He tossed one inning in the All-Star Game, striking out two and walking one (who was erased trying to steal second). Holt struck out 10 or more batters in a game on four separate occasions, and thrilled the home crowd when he tied a franchise record with 14 Ks in a single game (in just six innings) on July 24th vs. Vermont. In his last start of the season, September 1st at Aberdeen, he almost duplicated the feat, striking out 12 batters in just 5.2 innings. Joining Holt on the All-Star team, and at the top of the league leaderboard, was righthander Chris Schwinden. Schwinden was selected by the Mets in the 22nd round of the 2008 draft, and finished the season with the NYPL’s second-best ERA, at 2.01. Schwinden went 4-1, with 70 strikeouts in 62.2 innings. The top-ranked duo, along with other outstanding starters like Scott Shaw (6-3, 2.80 ERA, 79 K, 74.0 IP) and Jenrry Mejia (3-2, 3.49 ERA, 52 K, 56.2 IP) gave Brooklyn one of its best rotations ever. And when they were done with their work, the starters handed the ball off to a superb bullpen – featuring All-Star Yury Santana (2-4, 13 SV, 2.45 ERA, 37 K, 25.2 IP), lefthander Jimmy Johnson (5-0, 1.25 ERA, 41 K, 36 IP), southpaw sidearmer Roy Merritt (3-0, 1.49 ERA, 55 K, 42.1 IP), Stephen Clyne, Wendy Rosa, and others. The dazzling combo of starters and relievers contributed to another league best, as the Cyclones’ pitching staff led the NYPL with a 2.76 team ERA. Offensively, the ’07 Cyclones were led by outfielder Kirk Nieuwenhuis, who paced the team in virtually every statistical category, including average (.277), games (74), at-bats (285), runs (34), hits (79), doubles, (15), triples (five), walks (29), and stolen bases (11). “Captain Kirk” tied single-season franchise records for hits and games played and set a new mark for at-bats in a stellar first professional season. He logged 18 multi-hit games, including two four-hit performances, and had hitting streaks of six, seven (twice), and eight games throughout the year. Nieuwenhuis played in all but one of the Cyclones' 75 games, patrolling both centerfield and right field, and showcasing outstanding defense, as well. The 21-year-old from Ripon, CA heated up as the summer progressed, batting .240 (12-for-50) in June, .278 (27-for-97) in July, .288 (34-for-118) in August, and .300 (6-for-20) in September. Nieuwenhuis also stepped up his game in clutch situations, batting .316 (36-for-114) with runners on base, and .325 (13-for-40) with runners on and two outs. C Jordan Abruzzo, IF/OF Eric Campbell, and 2B Josh Satin turned in solid offensive seasons, as well. Brooklyn's .247 team batting average ranked ninth in the league. One hitter, in particular, caused a buzz when he joined the team in late August. Shortstop Wilmer Flores became the youngest player ever to play for the Cyclones, taking the field on August 28th, just two weeks after celebrating his 17th birthday. Flores went 3-for4 with a double and an RBI in his debut, and is now widely regarded as one of the top prospects in the New York farm system. 2008 also saw the return of a familiar face. Angel Pagan, a hero of the inaugural 2001 team, reported to Brooklyn on a major-league rehab assignment, after injuring his shoulder while making a spectacular catch for the Mets. Pagan played in four games for the Cyclones in ’08, and stole three bases, to extend his all-time club record (33). Despite a late-season charge, including 14 wins in the team’s final 18 games, Brooklyn was eliminated from the playoffs on the penultimate day of the season, thanks to a heartbreaking 5-3, 11-inning loss. The Cyclones again led the league in attendance, with a total of 265,220 fans in 36 openings, for an average of 7,367 fans per game in the eighth great season of Brooklyn baseball. The 2009 Cyclones burst out of the gates to a franchise-best 16-2 record through the first 18 games of the season, thanks to a season-high 10-game winning streak. The team endured ups and downs throughout the rest of the campaign, however, and lost the division lead in the final week of the season, finishing at 45-30 on the year. Brooklyn still made the playoffs, though, as the Wild Card team -- the sixth time in nine seasons that the team advanced to the postseason -- but were swept by the Mahoning Valley Scrappers in the first round of the NYPL Playoffs, two games to none. Among the highlights on the field was the first no-hitter in franchise history, thrown by Brandon Moore, who also led the team and finished fifth in the NYPL with a 2.09 ERA. The Cyclones' "other" ace, Mark Cohoon was named the team's MVP, thanks to a league-leading nine wins, and a 2.15 ERA. Moore, and Cohoon were named to the 2009 All-Star team, along with Dock Doyle, Jim Fuller, Sam Honeck, and Luis Rivera. The Cyclones also gained national publisity with promotional nights like "Baracklyn" and "Bellies & Baseball." The team led the league in attendance for the ninth straight season. The 2010 season was the 10th in franchise history, and the Cyclones enjoyed one of the team’s most successful campaigns ever, thanks to record-setting performances, both on and off the field. Led by Mets legend Wally Backman in his first season returning to the organization that drafted him – and exhibiting the fiery passion and grit that made their manager a fan favorite – Brooklyn finished with a 51-24 record, the best in the New York-Penn League, and went an eye-popping 30-8 at home. The overall record was just one win shy of the club’s all-time mark, and the home record tied the 2001 squad’s for the best ever. On the strength of that success, Brooklyn captured the McNamara Division crown, its fifth title in 10 seasons. In addition, the Cyclones led the NYPL in attendance for the 10th consecutive season, with an average of 7,147 fans per game (264,441 total fans in 37 openings), bringing the club’s all-time attendance to 2,871,993. Brooklyn’s individual record books were rewritten in 2010, thanks to some standout performances – particularly on the parts of centerfielder Darrell Ceciliani and right fielder Cory Vaughn. Ceciliani's .351 average was the highest single-season mark in franchise history, and he became the first Cyclones player ever to win the New York-Penn League batting title. In addition to his .351 batting average, the 20-year-old also established new franchise records with 95 hits, 56 runs, and 12 triples – all despite missing a week of play due to injury. At season’s end, Ceciliani was named Brooklyn’s Sterling Award winner – emblematic of the team’s MVP. Vaughn – the Mets’ fourth-round pick out of San Diego State University – was the team’s top slugger, setting new franchise marks in both home runs (14) and RBI (56) in his professional debut. Vaughn broke the club’s home run record in dramatic fashion, belting his 14th home run on the last day of the regular season to break a club mark that had stood since the inaugural 2001 campaign. While Ceciliani and Vaughn led the charge, the Cyclones’ success was a total team effort. Brooklyn led the league in both team batting average (.283) and team ERA (3.05), doing so for the first time since 2001. Brooklyn also set a new club record with 64 home runs, eclipsing the previous mark of 58, set by the 2001 team. In all, a record eight Cyclones were named to the 2010 NYPL All-Star Team. Righthander Yohan Almonte went 8-4 and led the NYPL with a 1.91 ERA, allowing just 19 earned runs in a team-high 89.2 innings pitched. Joe Bonfe was a steady force in the lineup, batting .326 (88-for-270), with 41 runs, 13 doubles, one triple, four home runs, and 28 RBI, primarily serving as the Designated Hitter. Lefty Angel Cuan ranked second in the league with a 2.03 ERA, and went 5-1, with a team-best 64 strikeouts in 79.2 innings. 6’6” slugging first baseman Jeff Flagg placed himself second (behind Vaughn) in franchise history with 52 RBI, scored 39 runs, belted nine round-trippers, and was Brooklyn’s 2010 iron man, playing in a team-high 73 games. No Cyclones player had ever driven in 50 runs before 2010, but Vaughn and Flagg both achieved the feat in the club’s tenth season. Righty Ryan Fraser burst on the scene in his first professional season as perhaps the league’s most dominant reliever. The flamethrower led Brooklyn with 12 saves, and sported a miniscule 1.44 ERA, allowing just five earned runs in 31.1 innings, while striking out 39 batters. Shortstop Rylan Sandoval was one of the summer’s best stories – an undrafted free agent, discovered by chance by Wally Backman, who wound up become one of the team’s best players, and its unquestioned leader, both on and off the field. Sandoval hit .330 (61-for-185), with 34 runs, 13 doubles, nine home runs, 29 RBI, and eight stolen bases – amassing spectacular numbers in just 47 games before being hit by a pitch that broke his hand and ended his season. Lefthander Chris Hilliard was not an All-Star, but tied a club mark with nine wins, going 9-1 on the year, with a 3.74 ERA in 14 starts. The 2010 Cyclones charged into the postseason, and defeated the Jamestown Jammers in the NYPL Semifinals, but were bested in the Championship Series by the Tri-City Valley Cats, leaving Brooklyn’s championship dreams to sing a familiar refrain throughout the borough – wait ‘til next year! Brooklyn’s 2010 success was not limited to the baseball diamond, though. The team again introduced some of the most unique promotions and entertainment in all of sports, including an upside-down Ike Davis bobblehead (capturing the Brooklyn alum making one of his trademark catches over the dugout railing), the wildly popular Jersday Thursday series (with high-quality replica jersey giveaways at every Thursday game), and the hilarious “Jersey? Sure!” promotion (which featured Baseball Blowouts, Dugout Dance Battles, GTL Giveaways and other assorted fist-pumping fun, and was named Minor League Baseball’s 2010 Theme Night of the Year, and 2010 Overall Promotion of the Year). In addition, the team’s ballpark was re-christened MCU Park, as a new business partnership with New York’s premier credit union brought a new name, new relationships, and new opportunities for involvement throughout the Brooklyn community. 2010 was another Summer of the Cyclones on Coney Island, with fans being thrilled by great baseball and wild & wacky fun! The Cyclones continue to provide a proving ground for the stars of tomorrow, and unforgettable entertainment to the country’s most passionate and knowledgeable fans. The names and faces on the field are always changing. Players are here for brief periods of time, and then take different paths as they move forward. Whether they spend one week or one year with the Cyclones, though, these young men become a part of Brooklyn baseball history. The excitement and energy of our city will stay with them forever, and Cyclones fans will always remember the time they spend at MCU Park. After coaching for nearly 30 years in the Major Leagues, Rich Donnelly came to Brooklyn with a winning attitude that spread on to his players. The Cyclones would finish the season strong winning six games in a row earning themselves the Wild Card spot, and another postseason birth. It should be no surprise to the fans of the Cyclones that the Brooklyn Cyclones, for the 11th year in a row, would go on to lead the NYPL in attendance. The team brought in a total of 245,087 fans, averaging just over 7,000 fans a game. The team also welcomed their 3,000,000th fan to the game, as the Cyclones became the fastest team to reach such a mark in the NYPL. These fans had a chance to see seven players who were chosen to play in the All-Star game. These seven players included: Danny Muno, Richard Lucas, Charley Thurber, Travis Taijeron, Tyson Seng, Todd Weldon and T.J. Chism. This marked back to back years that the Cyclones had at least seven players chosen for the All-Star team. Danny Muno had one of the best seasons in franchise history, breaking the all-time record for batting average in a season, with his .355 average. The former Fresno State Bull Dog had 28 extra base hits, 43 walks, and nine stolen bases and finished the season among the league leaders in on-base percentage and doubles. Muno would then go on to earn himself the Sterling Award, emblematic of the team’s MVP. Richard Lucas and Travis Taijeron both had very good seasons serving as the power hitters for the Brooklyn Cyclones. Lucas would finish the year hitting .300 and recording 6 home runs to go along with 41 RBIs and 46 runs scored. Taijeron would finish tied for 3rd in home run hitting with 9 to go along with a .299 average and 44 RBIs. With the assistance of these three hitters, the Cyclones ranked 3rd in the NYPL with a team hitting average of .261. The pitchers on the Cyclones staff did just as well as the hitters, finishing ranked 3rd in the league with a 3.06 team ERA. Marcos Camarena was the Cyclones top starter in terms of ERA at 3.13 through 63.1 innings pitched. Not only did Camarena have an outstanding ERA, he also held his opponents to under one hit per inning and struck out four batters to every walk he would give up. The bullpen was led by T.J. Chism and Tyson Seng, who were both All-Stars. Chism had a 1.14 ERA through 31.2 innings pitched striking out 30 batters and only giving up four earned runs. Seng had a 0.90 ERA through 30 innings of relief striking out 32 batters and only allowing three earned runs. The starters and relievers both had tremendous years. The team could not have accomplished everything they did without the continued support of the fans that come out and support game after game. The Cyclones are the fastest organization to reach the 3,000,000th fan mark in NYPL history. We hope that you fans come out and support the new players that will be wearing the Cyclones uniform. The Cyclones continued their winning ways in 2012, finishing with a record of 45-31, making it 12 consecutive seasons of over .500 baseball. In his second season at the helm as manager, Rich Donnelly led the Cyclones to their fourth consecutive post-season appearance beating out the Batavia Muckdogs by one game in the wild card race. The Cyclones were led by an excellent pitching staff that finished with a 2.62 ERA, the best in the New York-Penn League. At the front of the Cyclones dominant rotation was RHP Hansel Robels, who led the NYPL with an astounding 1.11 ERA. Robles was joined by three of his teammates, Gabriel Ynoa, Luis Mateo, and Luis Cessa, who finished in the top 10 in ERA. Robles, the Cyclones 2012 Sterling award winner didn’t allow an earned run over his final 45.0 innings of work, dating back to the end of July. The Cyclones lost in the NYPL Semi-Finals to the Hudson Valley Renegades, but Robles had one of the most impressive starts in franchise history in game one of the series. Robles tossed a complete game shut-out becoming the third pitcher to throw a 9.0 inning complete game in Cyclones history, and the first to do so in the playoffs. The Cyclones were atop most of the NYPL pitching rankings in 2012, leading in shutouts (10), and saves (27). Luis Mateo and Rainy Lara finished one-two in strikeouts in the NYPL, and Lara threw two games in which he reached double digit K’s. Stars Brandon Nimmo and Kevin Plawecki contributed in big ways with the bat for the Cyclones. Nimmo finished tied for fifth in the NYPL for RBI with 40, and Plawecki tied for seventh in home runs with 7. Nimmo, the Mets first round draft pick in 2011, had a streak of 21 consecutive home games in which he reached base safely. Once again the Cyclones fans were there to cheer on their heroes at MCU Park and make for a fantastic summer in 2012. The Cyclones led the league in attendance 249,009 visiting the ballpark. It was an up and down season for the Brooklyn Cyclones in 2013 as they finished with a record of 38-37 during Rich Donnelly’s third and final season as manager of the Brooklyn Cyclones. On a high note, the team finished with a record above .500 for the 13th season. However, they were unable to extend their streak of post-season appearances to five in a row when they dropped four of their final five games to knock themselves out of contention. Once again it was the pitching staff that stood out, touting a 2.81 ERA, the second best in the New York-Penn League only by a small margin behind the State College Spikes’ pitching staff, which held a 2.80 ERA. Leading the charge on the mound for the Cyclones were Miller Diaz and Sterling award winner Robert Gsellman. The two starters finished the season as four-five in the top five for pitching in the league. Diaz finished the season with a 7-3 record and 2.03 ERA while Gsellman ended with a 3-3 record and 2.06 ERA. Second baseman L.J. Mazzilli led the team at the plate, batting a team-high .278 batting average. Mazzilli was in great form in mid-July when he increased his batting average by 52 points during a nine-game hit streak. Despite the setbacks caused by Hurricane Sandy the previous fall, the Cyclones and Coney Island community came together during the 2013 season. In order to fight back and help those affected by the devastating hurricane, the Cyclones began the Meaningful Mondays initiative where $3 from every individual ticket sold would go to local charities that focus on the recovery effort following the storm. 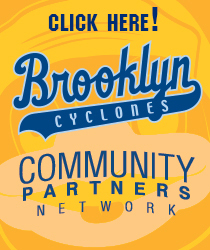 Once again, Brooklyn fans showed why they are the best in the NYPL, with over 232,000 fans packing MCU Park in 2013, the Brooklyn Cyclones lead the league in attendance for the 13th year in a row. The 2014 Cyclones featured one of the most talented roster in franchise history led by SS Amed Rosario, RHP Marcos Molina, 3B Jhoan Urena and OF Michael Conforto. Conforto, the Mets 1st round selection in the 2014 MLB Draft, joined the team in mid-July and quickly showed why he was widely considered to be the most "Big League-ready" talent in the draft. The former Oregon State Beaver hit .331 in 42 games with Brooklyn and never went more than two games without a hit. Conforto wasn't alone in his offense efforts though, as 3B Jhoan Urena ranked among the New York-Penn League Leaders in virtually every offensive category. Urena tied a franchise record by appearing in 75 games, and was in the lineup for game 76 but was ejected by the home plate umpire during the National Anthem following a "stand-off" with the Staten Island Yankees. Urena was joined on the left side of the infield by teenager SS Amed Rosario. The 19-year-old was one of the youngest players in the NYPL but performed like a veteran, hitting .289 in 68 games. But perhaps the most impressive performance by any Cyclone in franchise history was 19-year-old flame thrower, Marcos Molina. The righthander led the New York-Penn League in wins (7), ERA (1.77) and strikeouts (91) becoming the first Cyclones hurler to win the triple crown on the pitcher's mound. In 2014, MCU Park hosted the New York-Penn League All-Star Game for the second time, however this game ended in a 1-1 tie. The Cyclones also garnered national attention with their "Salute to Seinfeld Night" which celebrated thet 25th Anniversary of the show and was named MiLB's Promotion of the Year at the MiLB Promotional Seminar in Oklahoma City. The Cyclones finished the season with a record of 42-34 and came up just short of a playoff berth. Brooklyn defeated the Staten Island Yankees on the final day of the season, but needed a loss by the Connecticut Tigers loss to the Lowell Spinners to clinch a playoff spot. The Tigers had a late-inning rally though, and ruined Brooklyn's playoff dreams.